Souvlaki is so delightfully messy to eat…well…atleast the way we eat it. A garlicky, tzatziki and hot sauce slathered haven of tasty flavours. Yes, there is love for souvlaki here. Sitting back last night talking about the meal I kept saying to my husband “Wow…I can’t believe we just ate souvlaki.” He just laughed. I guess considering the meals I’ve converted to fit the new eating style around here already I shouldn’t be so surprised. I just couldn’t believe the portion and naughty feeling of it all. It brought me back to the first time I had it, served to me by this lovely greek gentleman. He was so impressed by the trust I put in the food. He asked tentatively whether I felt I could brave his special hot sauce. I said “Ofcourse! It’s part of the experience.” He put it on there and beamed at me with pride “Now! You eat souvlaki like real greek girls.” he said as he handed it to me. I ate it and was hooked. It was delicious. I definitely frequented that street vendor for as long I was in the area. So much souvlaki, such good times. Mix the oregano, garlic powder, lemon juice, and white wine together. Allow the chicken breasts to marinade in the mixture for atleast 4 hours. I always aim for 24 hours though. Cut the breasts into cubes. 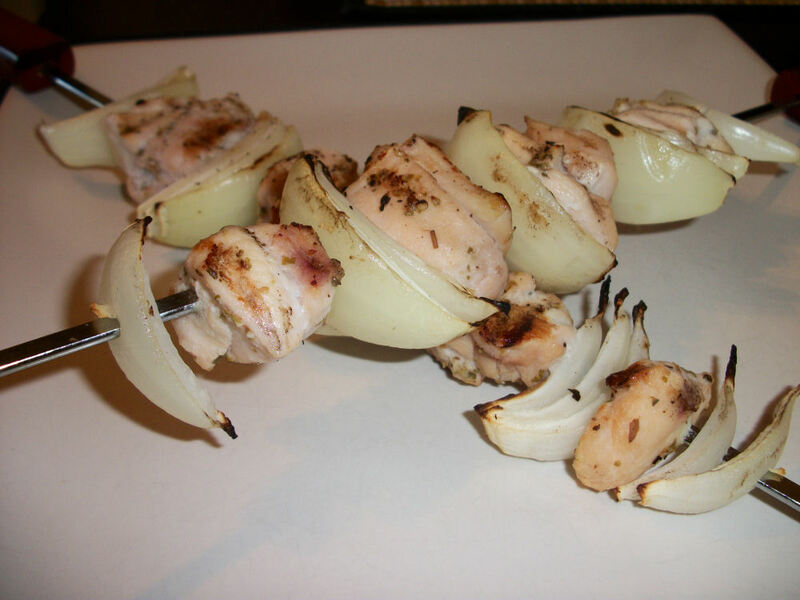 Thread onto skewers with wedges of onion in between the occasional piece. If you are using wooden skewers remember to soak them for 20 minutes first! Grill on medium to medium high heat until cooked, about 15-20 minutes depending on your cube size. This serves two. Each serving contains 138 calories, 1.2 grams of fat, and 2.5 grams of fibre. I use this marinade for pork, beef and lamb if you want to go for a different type of souvlaki. To serve we typically unload the skewers onto a whole wheat pita, top with tzatziki, tomatoes, cucumbers and hot sauce… go nuts! Have lots of napkins on hand because that won’t stay pretty for long! If you had your pitas stored in the fridge give them a little zap in the microwave, about 10 seconds should do. Warm pitas are a must! Enjoy! 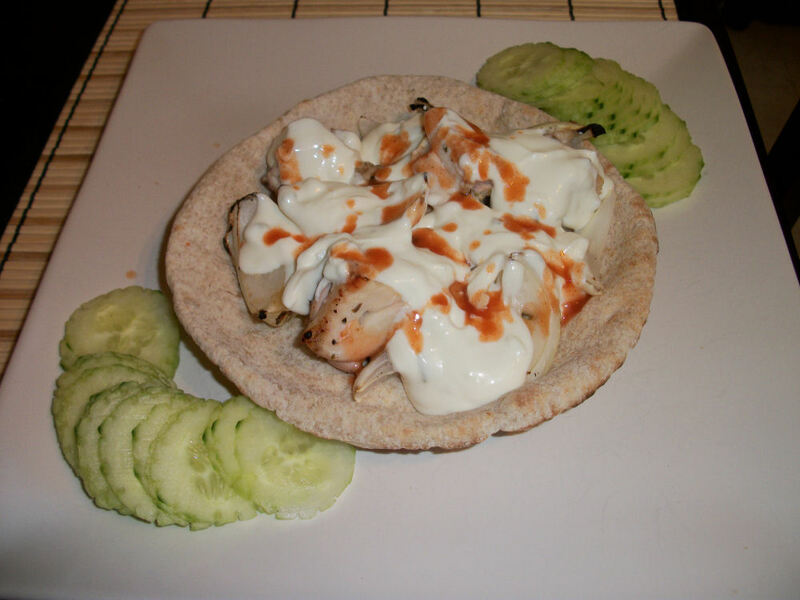 This entry was posted in Comfort Foods, Dinner, Lunch and tagged Chicken, Garlic, Onion. Bookmark the permalink.